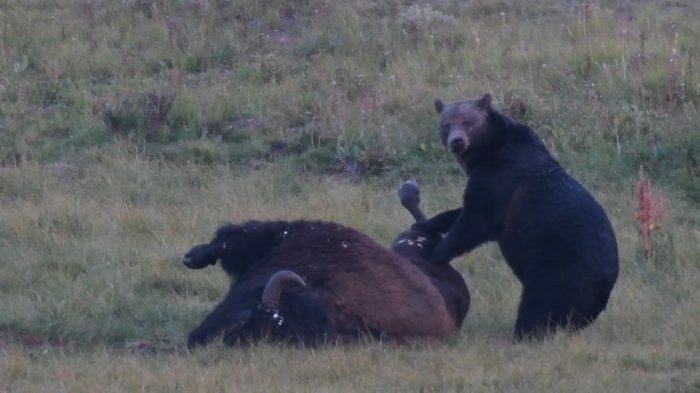 In the continuing effort to reduce conflicts between grizzly bears and livestock producers on the Rocky Mountain Front, Montana Fish, Wildlife and Parks is partnering with the Montana Stockgrowers Association, the National and Montana Wildlife Federations, and the U.S. Fish and Wildlife Service to implement a carcass collection and removal program. These partners have contributed local outreach efforts and logistics coordination, operating funds, and a truck with fuel to pick up carcasses from participating landowners. “As grizzly bears continue to move out from the Rocky Mountain Front and into areas they haven’t occupied, we’ll continue to look for ways to work with local producers, communities, and other partners to avoid or reduce conflict,” said FWP director, Martha Williams. The effort supplements efforts FWP and producers have made to redistribute carcasses close to the Front. This carcass disposal provides another option at no cost to landowners and will run until demand falls off later this spring or funds are exhausted, whichever comes first. Carcasses of dead livestock and other animals are significant attractants for grizzly bears, particularly in the spring as the bears emerge from winter dens. Carcass dispersal or removal helps reduce attractants that might otherwise draw bears into conflict with people or livestock. Grizzly bears in the Northern Continental Divide Ecosystem of Montana are still listed as threatened under the Endangered Species Act. The U.S. Fish and Wildlife Service has delisted grizzly bears in the area around Yellowstone National Park, as populations in that area reached recovery goals several years ago. The FWS has yet to propose delisting grizzly bears in the Northern Continental Divide Ecosystem, which encompasses the Rocky Mountain Front. Bear populations in the NCDE are estimated conservatively at 1,000, which surpasses recovery goals outlined in the FWS’s grizzly bear recovering plan. This partnership for carcass removal will focus on private lands in Teton and Pondera Counties. The carcasses will be removed and buried at the Valier dump site. For more information or to have carcasses removed, call (406)595-6689.